Since the inaugural event in 1876, the Brisbane Exhibition (or “Ekka” as it has been affectionately known since 1921) has embraced the dual values of tradition and progress, combining a celebration of the Queensland pastoral story with a curiosity for the modern and new. The illustrated front cover of a 1927 edition of The Queenslander embodied this spirit – a rugged agriculturalist, travelling to the Exhibition from “way outback”, clasps hands with an urbane gentleman clad in a blue leisure suit, both figures bestowed equal status. This receptiveness to modernity as part of Queensland’s unfolding story created fertile ground for the Art Deco aesthetic to find expression in Exhibition festivities during the 1920s and 30s, as revealed in the images that follow. In 1939, a new Electricity Hall (later Science Hall) was opened at the Exhibition to accommodate electrical and radio displays. This was the first permanent show pavilion of its kind in Australia, a move considered progressive for its commitment to showcasing modern technology. The hall was designed by Brisbane architect Richard Gailey Jr, also known for the Brisbane Arcade and Regent Theatre. Close examination of The Telegraph’s rendering of the building suggests the two side entrances (far left and far right) incorporated Art Deco forms, with stepped skylines, rounded edges and, in the case of the left entrance, pronounced vertical piers. The hall was demolished in 1986 to make way for a new Exhibition Building now occupying the same site on the corner of Gregory Terrace and Costin Street. The Exhibition was a high point in Queensland’s social calendar – a place to see and be seen. Fashion was an integral part of the spectacle, evident in these covers from The Queenslander in 1934 and 1937, depicting city and country couples alike sporting frocks, coats, suits and hats now synonymous with Art Deco style. 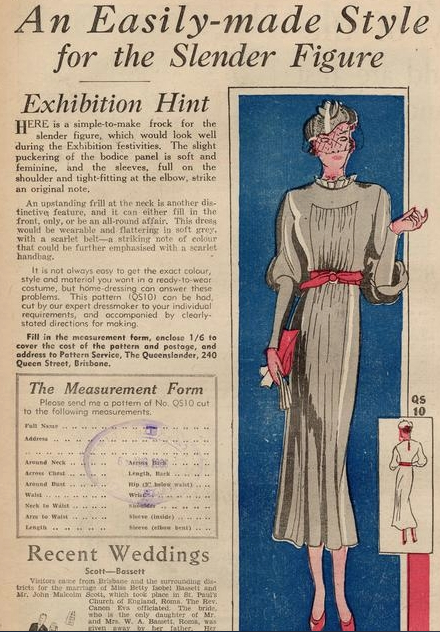 In 1936, The Queenslander Pattern Service gave home sewers scope to stitch their own frocks for Exhibition festivities, offering readers a bias cut dress pattern which was in vogue at the time. The “slight puckering of the bodice panel … and the sleeves, full on the shoulder and tight-fitting at the elbow” were said to “strike an original note”, helping fashion-conscious Exhibition goers stand out from the crowd. 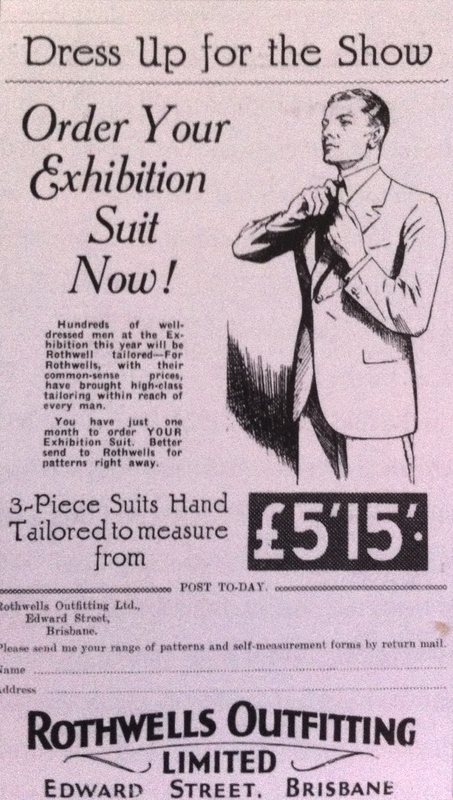 Women were not alone in this quest, with Rothwells Outfitting in Edward Street imploring men to order their suits a month in advance of the 1934 Exhibition, as they prepared to “dress up for the show”. These crowd shots from 1929, 1935 and 1939 confirm Exhibition visitors were eager to be spotted in the latest styles. 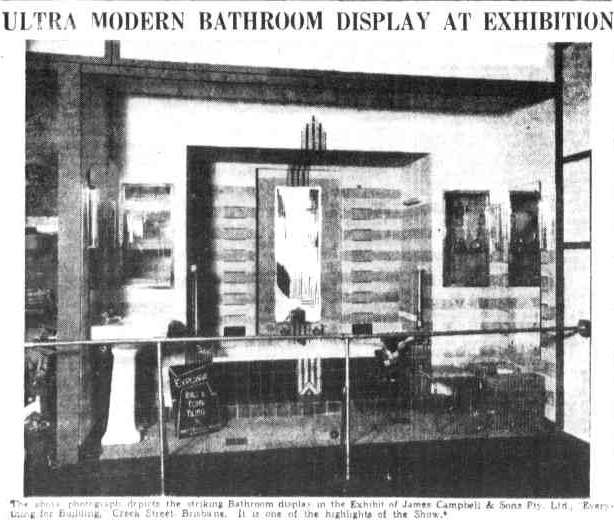 Although hard to make out, this newspaper photograph of an “ultra modern bathroom display” at the 1938 Exhibition shows a strong inclination for Art Deco styling with its emphasis on both horizontal and vertical lines, decorative tiling and modern pedestal vanity. As another nod to the modern lifestyle, epitomised by Art Deco design, motoring occupied an increasingly important place in Exhibition displays. Newspapers were filled with illustrations of the latest models on show, from Pontiacs to Studebakers. This photograph of the RACQ Exhibition carpark in 1927 suggests the motoring spirit was alive and well in Brisbane in the interwar years, with parking at a premium as mass car ownership flourished. The enthusiasm for speed and transport that was characteristic of the Art Deco era carried through to sideshow alley, where children delighted in dodgem car and model aeroplane rides, as depicted in these images from 1938. Brisbane came alive with Exhibition Week festivities staged right across town in the 1920s and 30s, from balls and dances, to official receptions, parties and picnics. 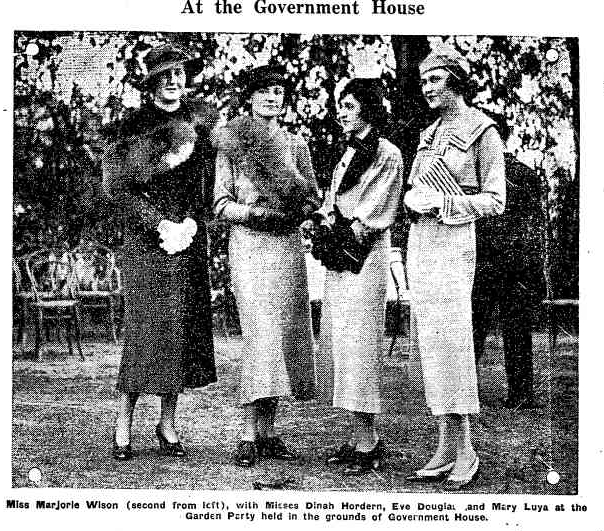 Newspapers snapped photographs of Queensland “high society” spotted at these events, such as the Brisbane Mannequin Parade at City Hall and a garden party at Government House in 1933. 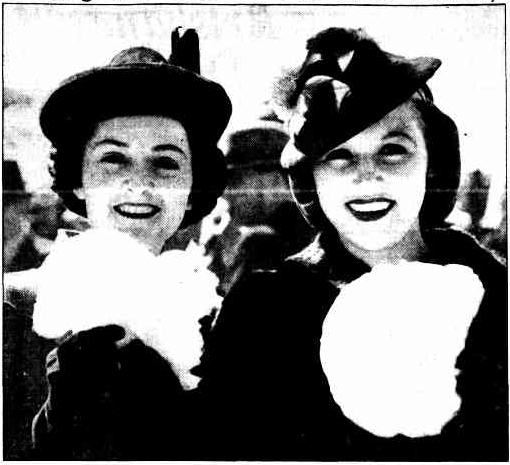 Races held at Ascot and Eaglefarm to coincide with the Exhibition were popular social occasions in the 1930s, not only for gambling, but also for dining, listening to music and promenading, providing yet another opportunity to don the latest fashions. As evident in these images, the Exhibition and its patrons eagerly embraced modernity in its many manifestations during the 1920s and 30s, cementing the show as a celebration of tradition and progress in equal parts. In this sense, the Brisbane Exhibition was another influential avenue through which Art Deco style burgeoned in Queensland. 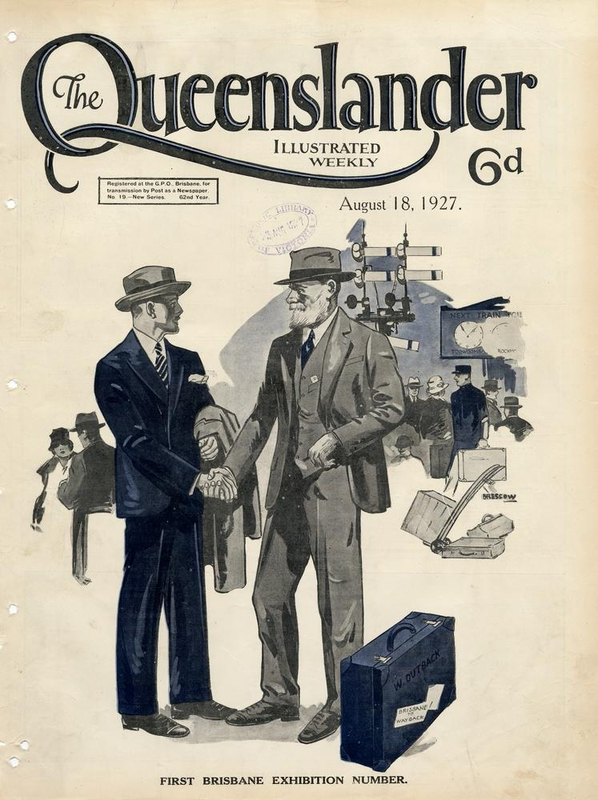 Illustrated front cover from The Queenslander, 18 August 1927. Courtesy State Library of Queensland. New R.N.A. Electricity Hall, The Telegraph (Brisbane), 10 August 1939. Illustrated front cover from The Queenslander, 2 August 1934. Courtesy State Library of Queensland. Illustrated front cover from The Queenslander, 19 August 1937. Courtesy State Library of Queensland. An Easily-made Style for the Slender Figure, The Queenslander, 6 August 1936. 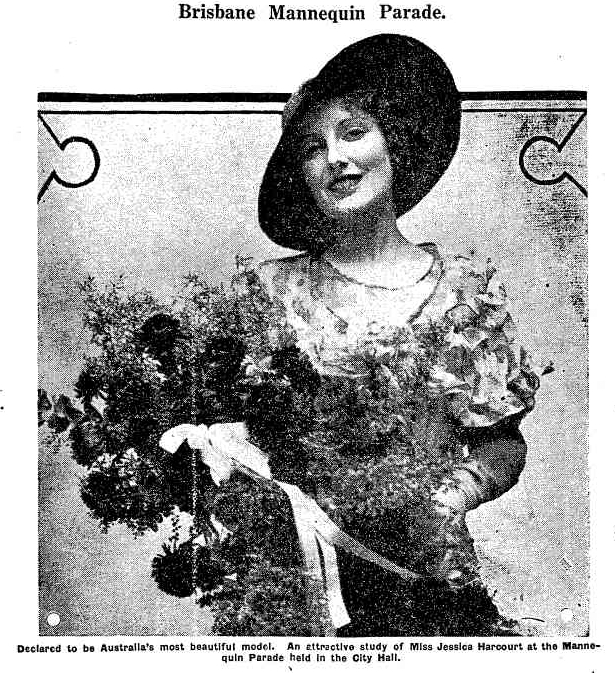 Dress Up for the Show, Queensland Agricultural Journal, July 1934. Vice Regal group and prominent visitors at RNA Show, August 1929. Courtesy Queensland State Archives. 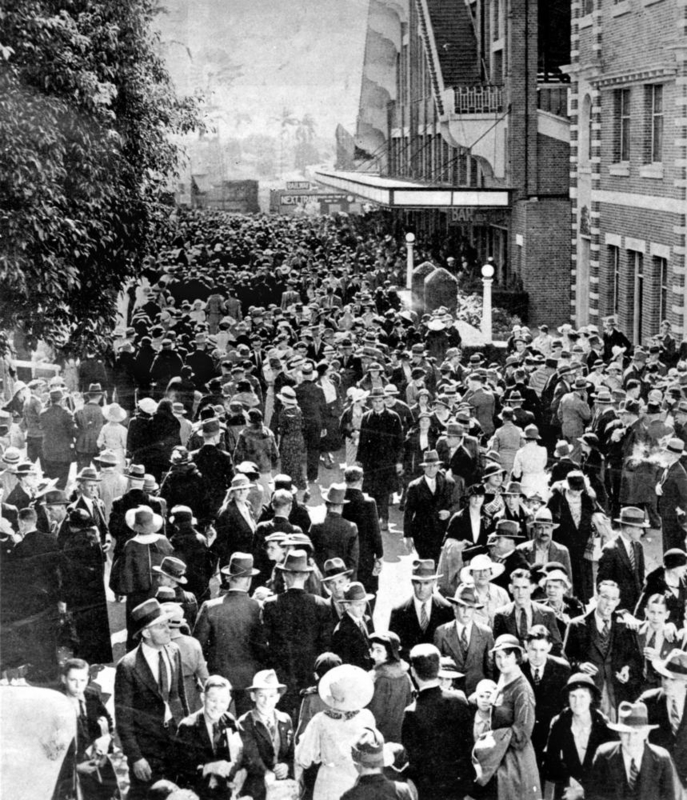 Milling crowds at the Brisbane Exhibition, August 1935. Courtesy State Library of Queensland. Making the Best of the Show Holiday, The Courier Mail, 17 August 1939. Ultra Modern Bathroom Display at Exhibition. The Telegraph (Brisbane), 18 August 1938. 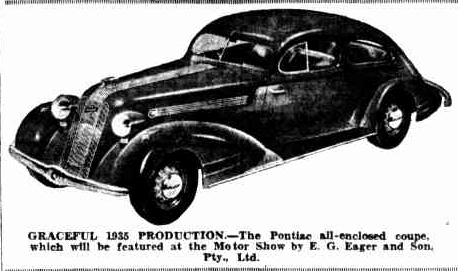 The Motor Show, The Courier Mail, 13 August 1935. 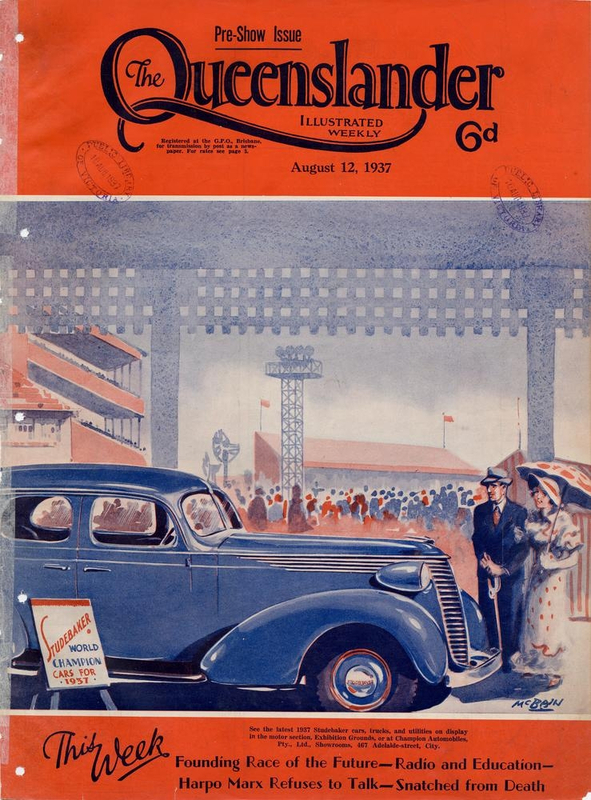 Illustrated front cover from The Queenslander, 12 August 1937. Courtesy State Library of Queensland. 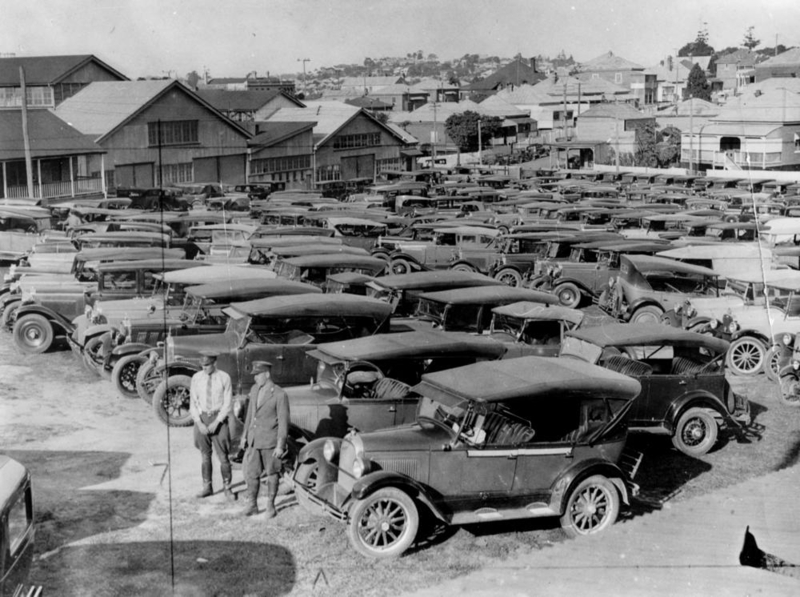 RACQ parking lot in Fortitude Valley during the Brisbane Exhibition, ca.1927. Courtesy State Library of Queensland. Dodgem cars at the RNA showground, Brisbane, 1938. Courtesy State Library of Queensland. Children enjoying an aeroplane ride at the Exhibition, Brisbane, 1938. Courtesy State Library of Queensland. Brisbane Mannequin Parade, Nambour Chronicle and North Coast Advertiser, 11 August 1933. At the Government House, Nambour Chronicle and North Coast Advertiser, 11 August 1933. 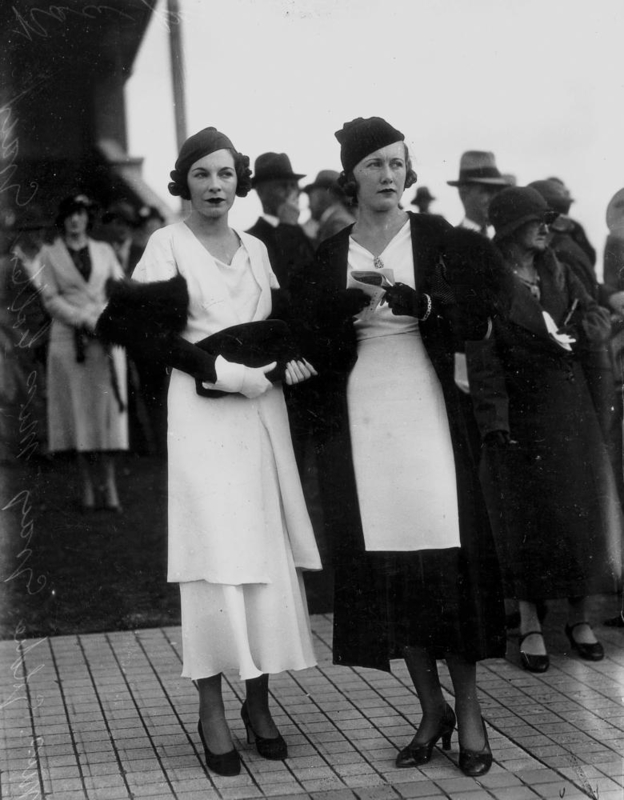 Colleen and Goldie Gray at the Ascot races, Brisbane, August 1933. Courtesy State Library of Queensland. 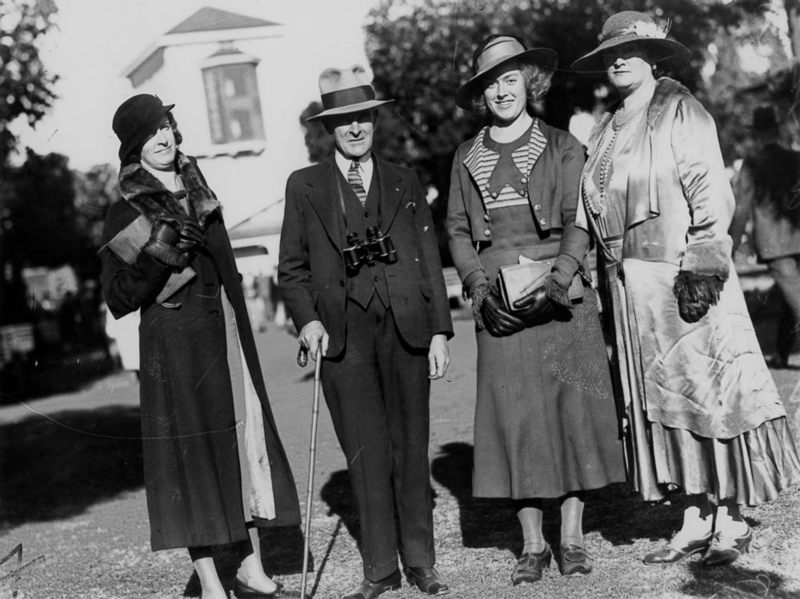 Group of racegoers at Ascot, Brisbane, August 1932-3. Courtesy State Library of Queensland. “An Exhibition for the Homemaker: Ideas for Building and Furnishing The Complete Modern Home.” The Telegraph (Brisbane). 14 August 1939, p.20. “Brisbane Exhibition Grounds.” Queensland Heritage Register. Department of Environment and Heritage Protection, Brisbane, 2003. “Electricity Hall A Highlight.” The Courier Mail (Brisbane). 14 August 1939, p.8. “History of the RNA.” RNA website. Accessed 9 August 2015. “Many Dances Arranged for Exhibition Week.” The Telegraph (Brisbane). 4 August 1937, p.20. “New Electricity Hall for the R.N.A.” The Telegraph (Brisbane). 2 March 1939, p.10. Scott, Joanne and Ross Laurie. Showtime: A History of the Brisbane Exhibition. University of Queensland Press, Brisbane, 2008. Thanks Iona. Loved reading the history of the Ekka long before I came to Australia in 1969. As you know, I always love spending a day “free ranging” over the Craft Pavillion and around the animal stalls. From their straw beds I can sense the look of “Oh she’s back. That strange woman who talks to us”. Love being one of the big crowd too – all enjoying themselves on this very special occasion in our annual calendar. Lovely to learn the Ekka was the place to be seen! Were people dressing up or did they dress so smartly on a daily basis? Thanks for this great post! So interesting to see Queensland advancing the modern spirit. So unexpected at the Ekka. Thanks Marina. From what I’ve read the Ekka was a big deal in the social calendar so I think it was an occasion to dress up. Really interesting post thank you! I wish we still went to the trouble of wearing ‘going out clothes’ to the Ekka but I know that I will be donning sneakers and jeans again this year….